I'd like to introduce you to Ology! Ology is the first nationally accessible and affordable brand formulated to be free of harmful chemicals! Ology is a Walgreens family of companies exclusive brand and features a line of baby and personal care products as well as household cleaners! Ology is the solution to the growing consumer demand for products free of harmful formulations! Check out their full press release here. I received a $15 Walgreens gift card to purchase an Ology product of my choice. 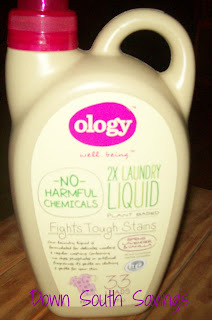 I chose the Ology 33 Load 2X Laundry Liquid in Spring Lavender and Vanilla for my review. It smells really good! My store also had the Ology Stain Fighting 2X Laundry Liquid Free & Clear. I chose Spring Lavender and Vanilla because it's comforting to me. I seem to rest well when my clothes and bed linens smell like Lavender. I have been known to wash my favorite blanket daily just to keep the smell of Lavender! The Ology brand definitely kept it's smell and it wasn't over bearing. My clothes also seemed to look cleaner after using the detergent. Another thing I appreciated was that I was not itchy after using the detergent. Huge plus! Many things I have used before would make me break out in hives and I did not experience that negative side effect with Ology. The detergent is plant based and is formulated for delicates, woolens, and regular washing containing no dyes, phosphates, or artificial fragrances! It's also gentle on your clothes and skin! Ology is HE and Conventional Machine Compatible. You can check out all of Ology's products by clicking here. They are available online and in store, so whatever your shopping needs, Walgreens has you covered! Below is a sneak peek of more Ology Products. Overall I am pleased with my purchase and look forward to trying more Ology products in the near future! Highly Recommend! Be sure to check them out on Facebook! I was sent a Walgreen’s gift card for the purposes of obtaining Ology products to review. No other compensation was offered or received. No suggestions or requests to select specific products within the Ology line were offered. I was in no way obligated to write a positive review and all opinions are mine and mine alone. Thanks for the review! I would be concerned with the Cocoamidopropyl Betaine as it's high on the allergen list. I will definitely give them a try. I'm always on the lookout for new products. Great products, Thank you for the review.